Axe body spray has a new Chocolate body scent. 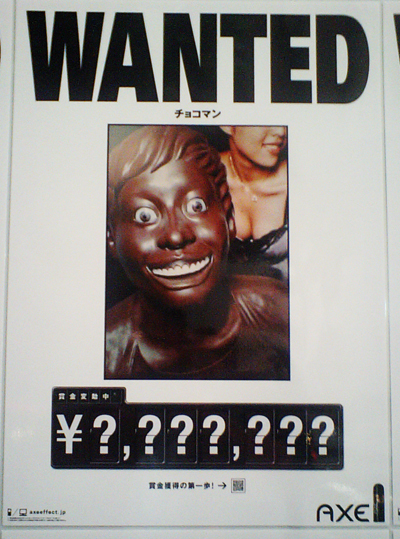 The ads posters that I found posted in Shibuya near Tower records were designed to look like a “Wanted” poster featurning a grinning and if you ask me, a somewhat creepy face of a Chocolate boy and behind him some cleavage. The first step in obtaining reward (賞金獲得の第一歩 with an arrow pointing to a Japanese cell phone scan barcode). These mobile/cell phone barcodes are a pretty common site on a lot of advertising in Japan. It usually offers some benefits in the form of discounts, samples, and other rewards simply by scanning the code and entering you cell phone email. The barcode itself isn’t really a barcode, but more of a square grid resembling a digital inkblot. This ad campaign also features TV commercials which appear to be exactly the same as the one shown outside of Japan (North America, etc.) 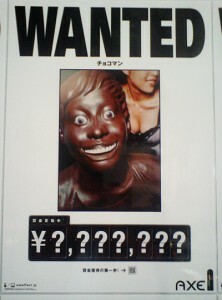 featuring a chocolate man walking around being chased and randomly bitten by females in his vicinity. You are currently browsing the archives for the Health and Beauty category. © 2019. Ads of Japan. Advertisiments and popular Japanese advertising campaigns. Powered by WordPress. Theme design by WPShoppe.